Launch of the Thai Powerlifting Federation! 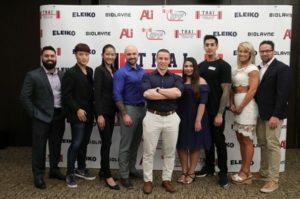 Two of the world’s leading powerlifting, fitness athletes and social media stars are leading a special showcase demonstrating the international sport of Powerlifting in Bangkok. Layne Norton and Holly Baxter headlined a special program of fitness and nutrition coaching over April 28 and 29, followed by a VIP press day on this April 30th. Fully endorsed and supported by International Powerlifting Federation (IPF), the program highlights the IPF’s commitment to developing the sport of drug-free competitive powerlifting globally, bringing this extraordinary show of strength, focus, balance and dedication to lifting to growing and increasingly enthusiastic weightlifting and fitness audiences in Thailand. John Coyle, future President of the Thai Powerlifting Federation (TPF), a newly created Federation affiliate in Thailand, introduced the arrival of the sport, explaining, “Powerlifting attracts a massive following of athletes globally, and we want to bring this sport to Thailand, to connect it to a new generation of lifters. The lifting community in Thailand can at times be inclined to follow a certain previously established (or assumed) ‘template’ for what is possible in lifting; that is, that performance-enhancing drugs are necessary to achieve one’s best. Supported by the IPF, powerlifting is a sport that is 100% drug-free, and this is a key principal for anyone who competes in the sport. We want to encourage all kinds of fitness enthusiasts, lifters and sports fans in Thailand to explore our terrific sport, revel in its expression of ‘natural power’, and discover their best performance as part of a really supportive international community”. Dr. Layne Norton, a top USA Powerlifter and ambassador for the TPF, says, “We’re here in Thailand to support the newly created Thai Powerlifting Federation, and we’ve had this great opportunity to take part in a Powerlifting demonstration as well as a two-day seminar and practical program. It’s an amazing thing to represent the IPF from America, which now has an exciting new affiliate here in Thailand! Both Holly and I are big fans of the sport. I’ve been competing myself for almost ten years; it’s absolutely changed my life and I love it. Thailand, if you want to compete at a high level in a drug-free environment, this is your only place to do it!”. Australian Fitness Model and social media star Holly Baxter concludes, “We’ve had chance to go through how the squat, deadlift and bench press work, and give people an idea of how the sport operates. Through the forthcoming two-day seminar and practicals, we’ve been able to attract new members, giving them the chance to begin to compete at a high level in a drug-free environment. It’s not just for big people or for guys; it’s for people of all sizes and from all backgrounds. It’s exciting to be part of this growing movement for drug-free competition, and offer an amazing platform for athletes and newcomers to get involved and experience the lifestyle which in itself is positively life-changing”.